From food carts to open-air eateries such as this one in the central neighborhood of Eminönü, Istanbul’s street cuisine draws from throughout Turkey as well as the wider Middle East, North Africa, Europe and beyond. Late one night during the winter of 1973, on a wind-blown, dimly lit street corner not far from Sirkeci train station, I walked through a light rain and noticed steam wafting from an open-air food stall. A tall, vertical spit, layered with roasting meat, was illuminated by a single bare light bulb as a man with an enormous black moustache wielded a long, shiny knife and what looked like a small stainless steel dust pan. He sliced, scooped and assembled ingredients and seasonings with astonishing speed and then wrapped them up in large cones of flat bread. A half dozen eager customers were lined up, and I joined them. 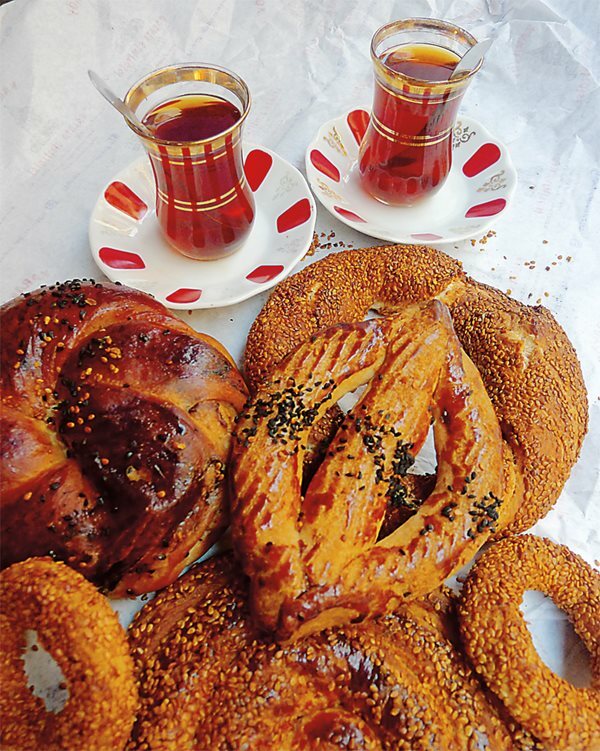 Above: Start the day with sesame seed-encrusted simit and sweet black tea; later on, try the city’s best-known street dish, the iconic marinated mix of lamb and beef, döner kebap (“turning roast”), lower. Within minutes, I took my first bite of döner. It was like nothing I had ever tasted before. Fragrant, crisp, succulent morsels of marinated meat combined with an exquisite medley of flavors from chopped tomatoes, cumin, parsley, red onions, green chili peppers, pickled cucumbers, salt and pepper, and other ingredients I couldn’t begin to guess. The next day, when I told a Turkish friend about my discovery, he laughed and told me that döner in Istanbul was as common as hotdogs in New York city. I didn’t care. 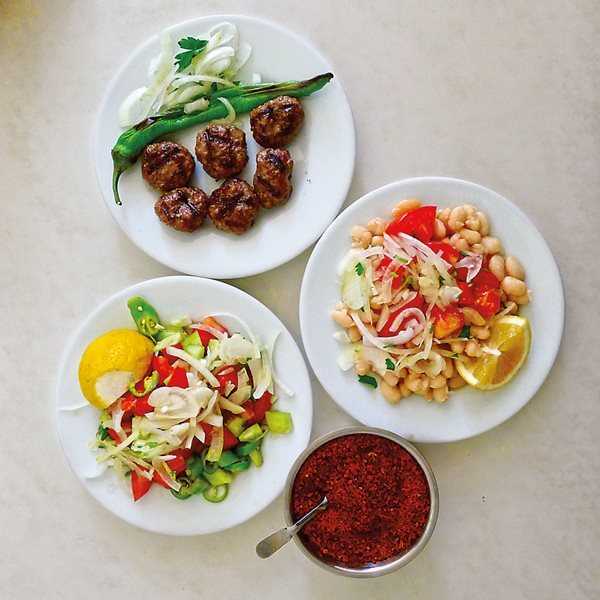 It was my introduction to Istanbul street food, and that first bite tasted like a delicacy prepared in the kitchens of the Topkapı Palace, fit for an Ottoman Sultan. Over the next few days, I wandered the waterfront neighborhood of Eminönü sampling street food in and around the 17th-century Spice Bazaar. I tried golden sundried apricots stuffed with walnuts; charcoal-roasted corn on the cob; fresh cow’s-milk yogurt covered in wild-bee honey; a cheese cured in a goatskin; roasted chestnuts still hot to the touch. I even tried a grilled fish sandwich prepared on a brazier perched on a cardboard box at the edge of a parking lot. 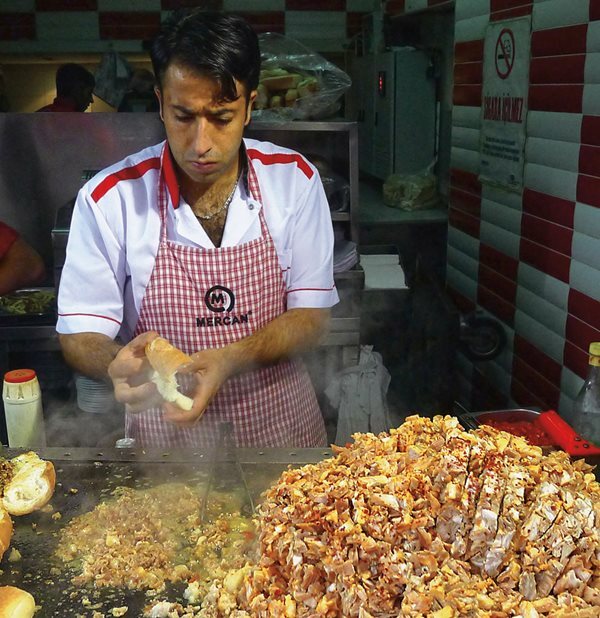 I was captivated by how Istanbul street food was, it seemed, everywhere. It was fresh, simply prepared, delicious and inexpensive. I left Istanbul a few days later wondering what other delicacies might be cooking in the backstreets. Forty-two years later, I returned to find out. Istanbul is famous for chaotic, adrenalin-inducing pedestrian traffic that ebbs and flows throughout the city day and night. Street food is tailor-made for this human tide. Office workers and construction crews, shoppers and shopkeepers, university students and schoolchildren: All have their favorite vendors, and all know where to find them at different times of the day. For the vendors, success is often determined by location, and this is why they often set up strategically next to bustling food markets, ferry boat terminals, and street corners and laneways with heavy foot traffic. There is nothing chic, trendy or fashionable about the stalls. The fare itself is all about familiar, favorite flavors and traditional foods for people on the move with only a few minutes to spare at a cart or at an open-air table shared with strangers. 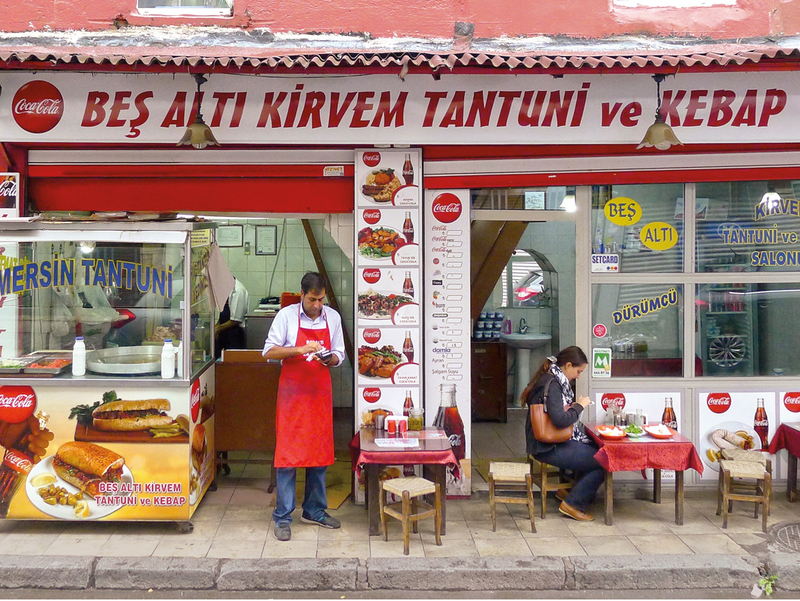 Street food culture is a part of the daily lives of the more than 15 million inhabitants of Istanbul. Each develops favorites at an early age and learns to recognize quality, which depends on fresh ingredients and a proper balance of flavors. A vendor who cannot meet these high standards will not be in business for long. 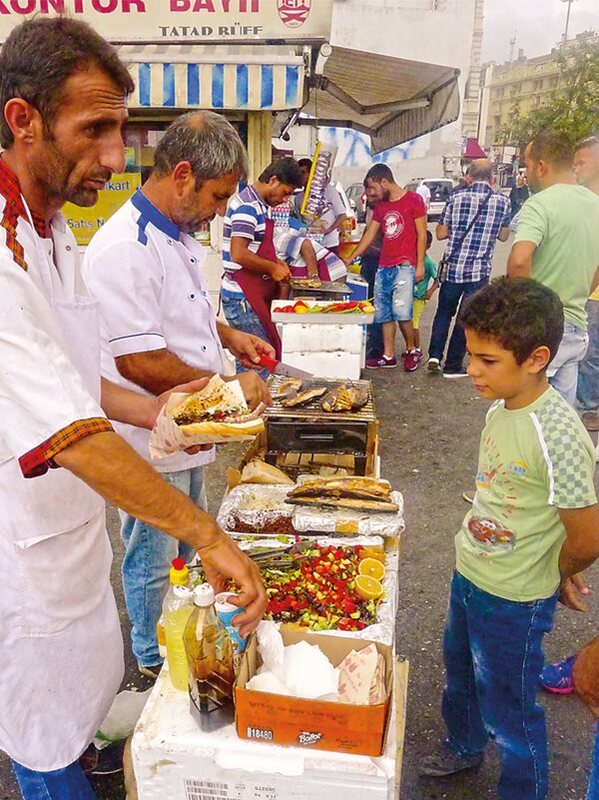 To help me sample as many of the classic street foods as possible and find the best of them, I joined forces with my friend the literary agent Nazlı Gürkaş, a longtime resident and, as it turned out, a street-food sleuth of the highest order. Together we visited both the European and Asian sides of the Bosporus to explore open-air markets, working-class neighborhoods, thoroughfares, sidewalks, alleyways and tiny storefront shops with walk-up window service. We tracked down itinerant vendors, such as the cucumber man who runs his business from a homemade wooden wheelbarrow on the Galata Bridge, but we failed to cross paths with a legendary pomegranate juice-maker who was constantly on the move with his pushcart, following a schedule known only to himself, or so it seemed. Nazlı explained how Istanbul street food has dishes from distant regions of Turkey and broadly reflects the cultural diversity of a city that has been at the crossroads of four civilizations over more than 3,000 years. The city was one of the great centers of the spice trade between Asia and Europe, and by the time of the Muslim conquest of the city by Sultan Mehmet ii in 1453, Istanbul had already combined culinary traditions from Central Asia, Anatolia, Egypt, the eastern Mediterranean, the Balkans, southern Russia, Persia, the Middle East and North Africa. Shortly after dawn on our first morning, we stepped onto the street where we were enveloped by the fresh smell of cobblestones washed by the night’s rain. The air was heavy with the fragrances of deep-roasted coffee and baked bread. Salty sea air mingled with the smoke of charcoal fires and the heady scents of an open-air flower market. A cruise liner sounded its horn, a tram rumbled by, and we could see street food vendors setting up their tables and wheeled carts. Istanbul was waking up, and for the next 10 days we wandered, sampling and searching for the best of what the vendors had to offer. Of course, no two people in Istanbul will ever agree on exactly the same list of top street foods—or where to find the best—but as a result of our discoveries, here is a sampling we agreed is a “must-try” list. 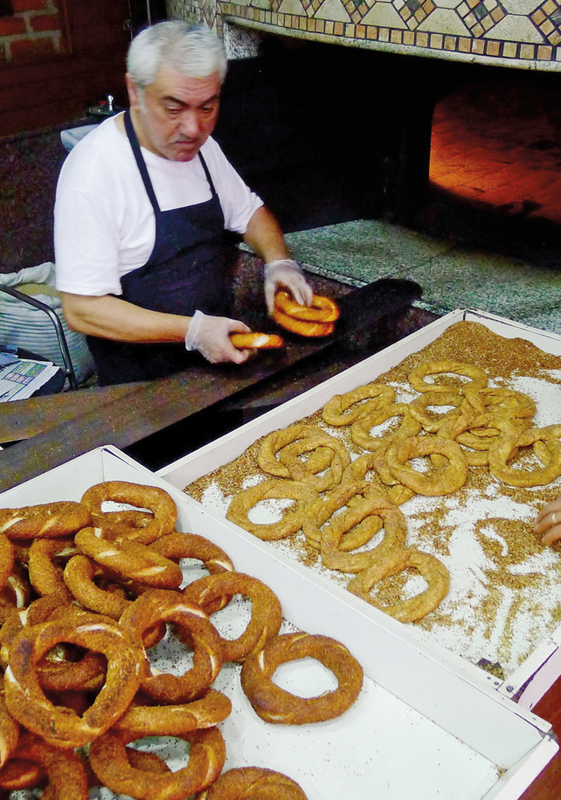 A bagel-like, twisted ring of chewy bread, flavored with molasses and covered with toasted sesame seeds, simit is an Istanbul staple. Dating back to at least 1525, it is still baked throughout many regions of the former Ottoman Empire. It is found at kiosks, in wheeled food carts and stacked high on trays perched atop the heads of its vendors. The very best simit? We found ours at Galata Simitçisi (“Galata Simit-maker”), a bakery run by Emir Özdemir. If you go, sit on a chair out front to eat it hot from the oven, and order sweet black tea from across the street. This is a popular Turkish breakfast dish of tomatoes, garlic, onion, oregano and green peppers served with egg, all made to order. 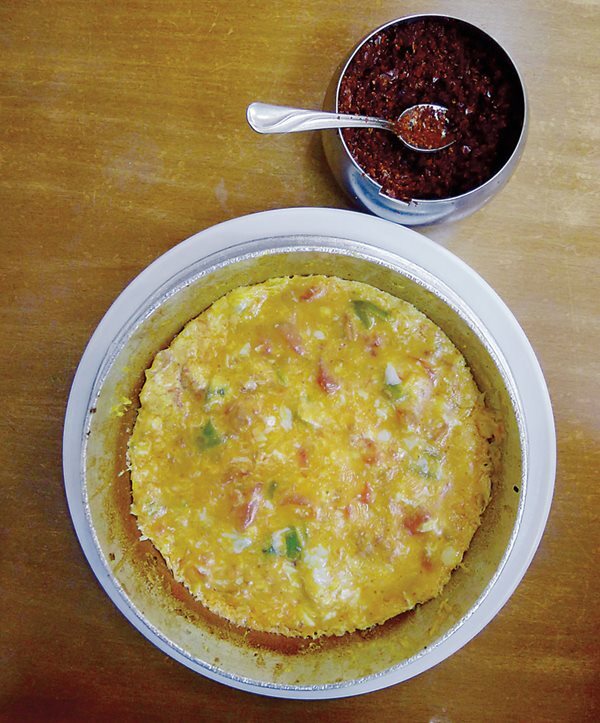 It is often brought to the table bubbling hot in a metal skillet. A pleasant place to try menemen is at the scenic waterfront establishment Çengelköy Çınaraltı. The boat-shaped “Turkish pizza” has many legitimate claims to its origin, but the style sold most often in Istanbul comes from Samsun. Pide is like a perfect thin-crust pizza: crunchy on the edge and chewy at the center. Pide is made to order with toppings such as kaşar cheese, sucuk (a dry garlic sausage), pastırma (a dry pastrami), spicy minced lamb or beef, tomatoes, eggs, roasted red peppers and long green chilies. The finished pide is often dabbed with butter and sprinkled with flecks of citrusy-flavored sumac. 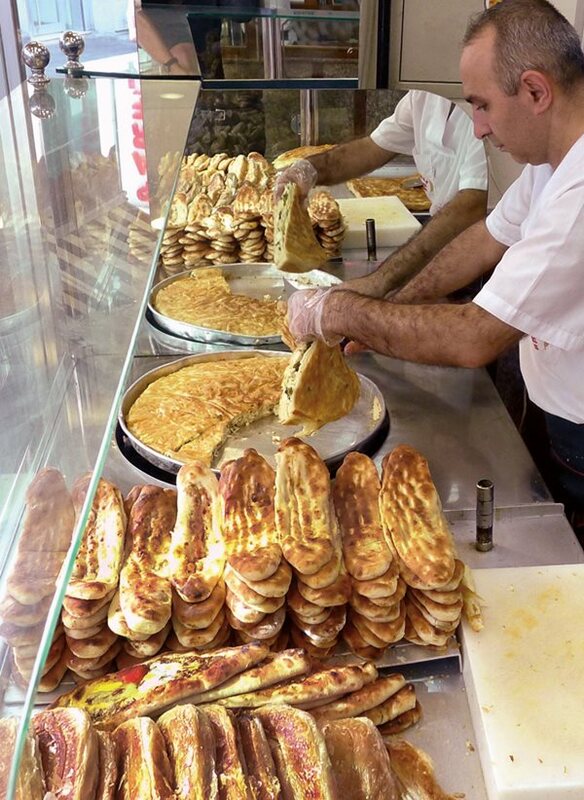 A centrally located place to try high-quality pide is between Sirkeci train station and the Topkapı Palace at Hocapaşa Pidecisi, where Davut Usta (master Davut) has been serving locals and visitors for nearly 30 years. Charcoal-grilled, spiced lamb meatballs prepared with onion, garlic, parsley, black pepper, cumin, oregano and paprika: No one knows how many places in Istanbul serve köfte, but in a city that takes its meatballs seriously, we found one of the best places is the popular, hole-in-the-wall Meşhur Filibe Köftecisi, where five generations of family ownership have been refining the art of köfte for 122 years. The only other thing on the menu is piyaz, a salad of sliced onion, tomato, cilantro and white beans with a dressing of lemon juice and olive oil topped with a sprinkling of sumac. Both dishes are extraordinary in their perfect balance of aromatic flavors, textures and tastes. Found often on street carts throughout the city, midye dolma are steamed mussels on the half shell stuffed with pine nuts, currants and rice seasoned with cinnamon, black pepper, chili flakes, parsley, dill and a generous squeeze of lemon juice. The fish market in Kadıköy is an excellent place to sample this delicacy at it freshest. At any time of day, it’s a refreshing and healthy snack. We found our favorite on the waterfront in the old Greek fishing village of Kanlıca, on the Asian side of the Bosporus. 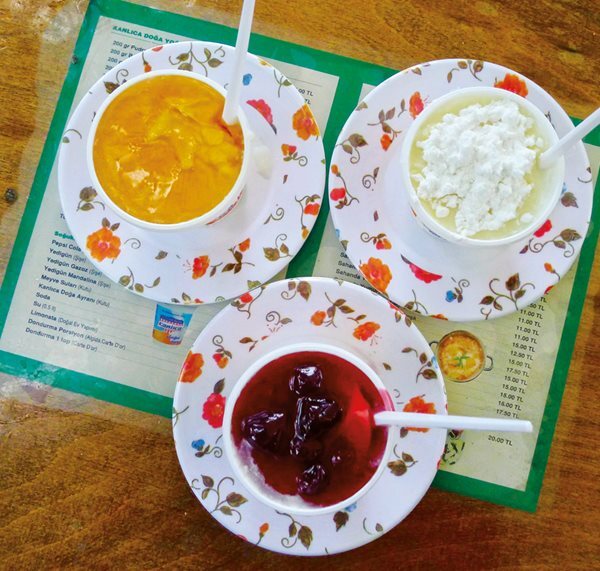 Its slightly tangy, Bulgarian-style yoğurt comes with a choice of three toppings: powdered sugar, honey or rich, thick berry jam. The tree-shaded, open-air garden right next to Kanlıca pier is the perfect setting to watch the boat traffic. This is a wrap (dürüm) of thinly sliced, spiced beef or lamb that is first steamed in salted water and then sautéed in cottonseed oil with onions, parsley, black pepper, hot chili flakes, sumac and green peppers. It is topped with fresh lettuce and tomatoes and then rolled up in flatbread that is heated on top of the ingredients as they cook. Tantuni has humble origins: It was formerly considered to be a “poor man’s food” because it was originally prepared with lung, fat and offal. According to 46-year-old Nevzat Koçak, chef at Baazen Tantuni, the dish made its way from Syria via the Turkish south coastal city of Mersin. In his 35 years of kitchen work, he estimates he has made more than 3 million tantuni. Literally, “turning roast,” from döner (to turn) and kebap (roast). 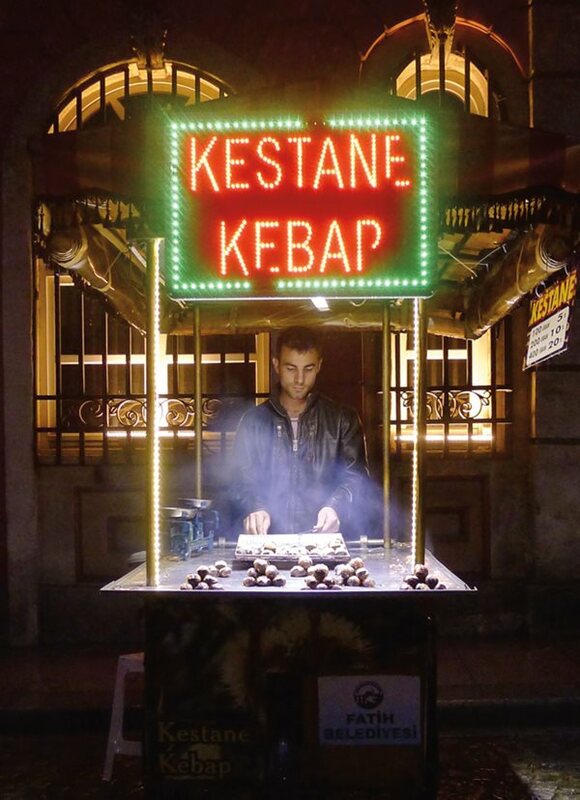 In recent decades, this has become the most commonly known Turkish street food worldwide. 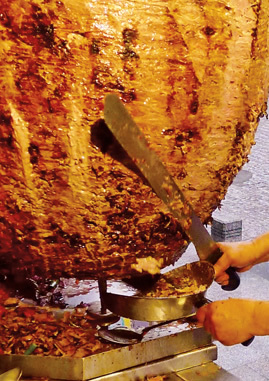 Just as I had first seen it in 1973, döner is prepared on a vertical spit that roasts stacked layers of meat. The quality of döner can vary greatly depending on the meat (usually a mix of beef and lamb) as well as the usta (master). Döner is served either wrapped in pide bread with tomatoes, onion and other ingredients, or tucked in a round crusty bread roll. Karadeniz Pide ve Döner Salonu is the place to go for Istanbul’s very best. This is the Turkish wrap. 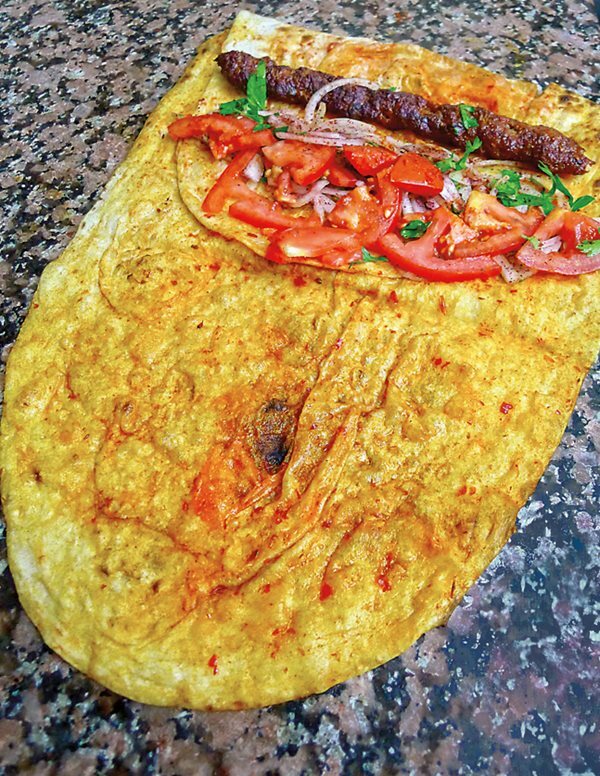 At its best, dürüm is a lightly grilled piece of flatbread (lavaş) smeared with juices from the cooking meat and red pepper paste, and then filled with spicy minced chicken or beef cooked on skewers over a charcoal fire. Tavuk şiş (chicken) or Adana kebap (spicy minced beef) are two favorites. Dürüm comes rolled up with chopped tomatoes, parsley, onions and a sprinkling of sumac. A well-prepared dürüm far exceeds the sum of its parts. Dürümzade is the most famous vendor in Istanbul. 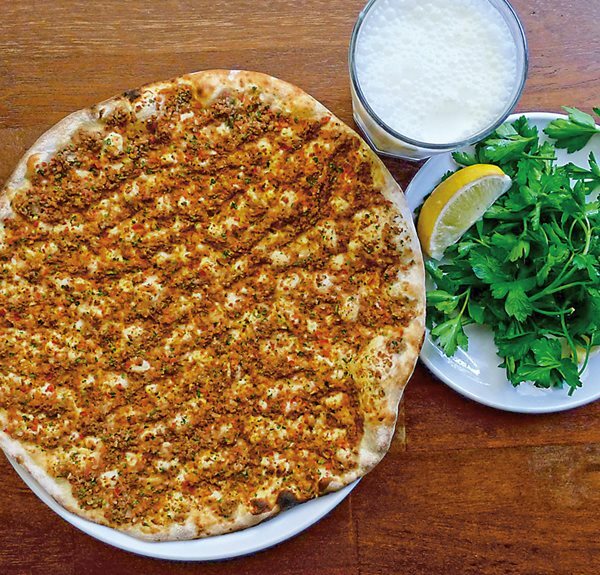 From the Arabic lahm ajin, “meat with dough,” lahmacun looks like a thin-crust pizza topped with a smear of finely minced meat, onions, cumin and salça, a paste of tomatoes and red peppers. As soon as the lahmacun is pulled from the brick oven on a wooden paddle, it is brought to the table piping hot. The customer sprinkles parsley, lemon juice and sumac on it and then rolls it up while still warm and pliable. For this, these neighboring shops in Kadıköy tied for the best. 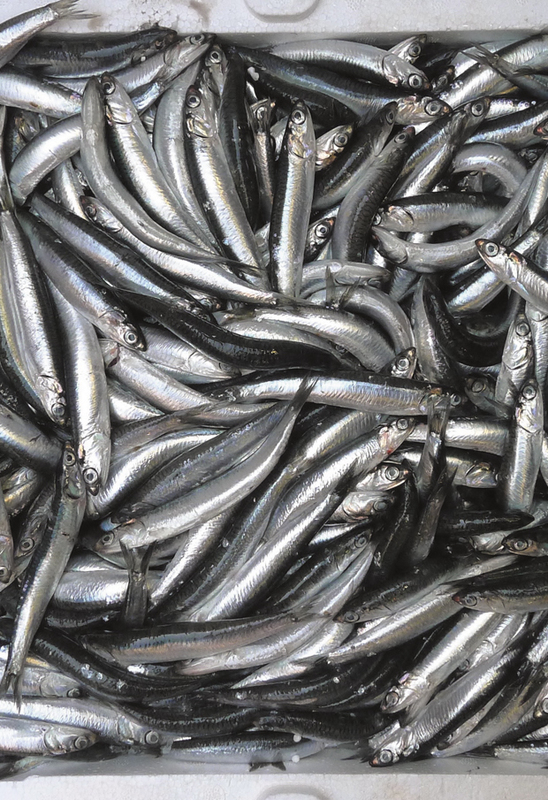 The famous Turkish anchovy (engraulis encrasicolus) has been praised in folk poems recited by itinerant storytellers along the Black Sea coast since ancient times, according to food historian Alan Davidson in his book Mediterranean Seafood (Penguin, 1972). Hamsi is a seasonal fish, available from mid-fall until around February, depending on the weather. Dipped in flour or cornmeal, fried, salted and then drizzled with a squeeze of lemon juice, it offers street cart finger food at its very best.We found excellent hamsi at cafes and street stalls along the edge of the bustling fish market in Kadıköy. Nazlı explained that locals favor hamsi from the cold waters of the Black Sea, north of the Bosporus, over hamsi from the warmer waters of the Sea of Marmara, at the strait’s southern end. 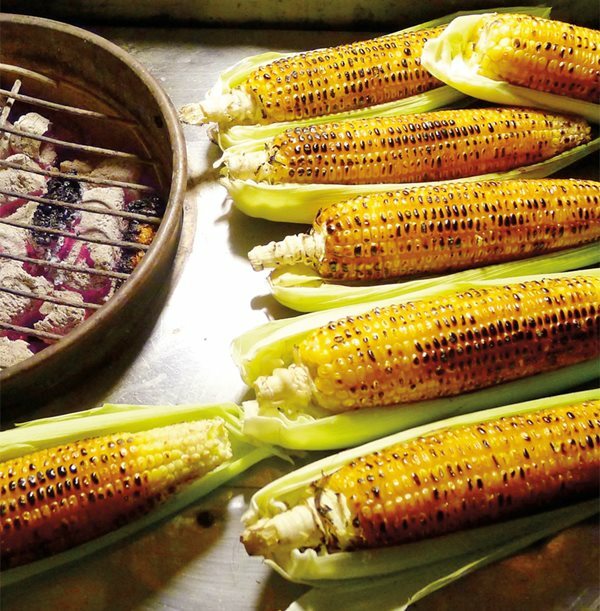 Grilled or boiled corn on the cob. Sprinkled with salt and served on a piece of green corn husk. Found everywhere, especially during summer. 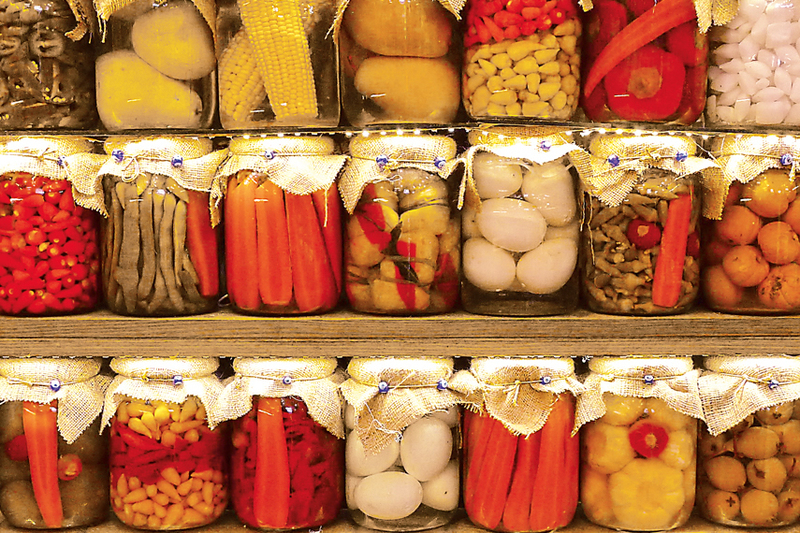 Turkish people are wild about crisp pickled vegetables. These can include whole garlic, carrots, beets, peppers, corn on the cob, decoratively wrapped-up cabbage, green beans and many more. The window displays alone are spectacular, as clear jars show off vibrantly colored edibles. Try either of these venerable pickle shops. Spicy, spit-roasted lamb sweetbreads, neck meat, offal and other specialty cuts wrapped in small intestines of lamb, kokoreç is roasted on a horizontal spit and then sliced into bits and cooked on a griddle with onions, tomatoes, green peppers, cumin, salt, pepper and other spices that vary from vendor to vendor. Generous portions of kokoreç are piled on a slightly toasted white bread roll. 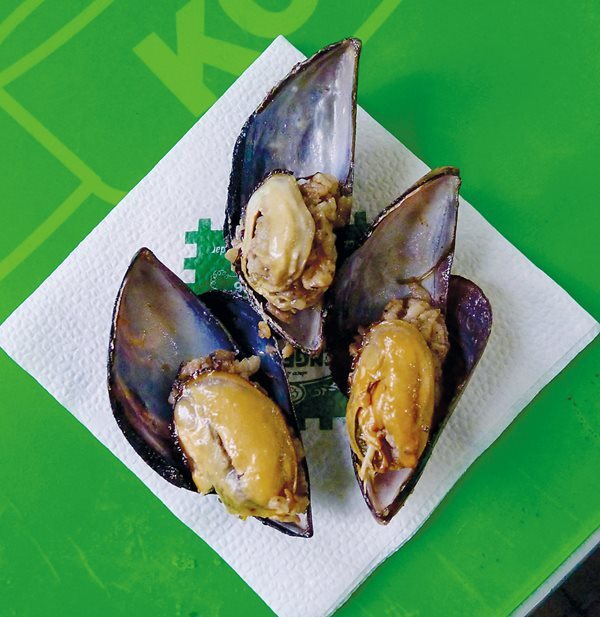 Excellent stalls with succulent and flavorful kokoreç are everywhere, especially near the main bazaars and shopping areas. The fragrance of charcoal-roasted chestnuts is one of the most evocative smells associated with the markets of Istanbul. Available for much of the year throughout the city, especially during fall and winter. Baked potato stuffed with any or all of these ingredients: sliced hot dogs, sweet corn kernels, pickled beet root, butter, yogurt, grated kaşar cheese, grilled or fresh sliced mushrooms, green peas, sliced black and green olives, grilled red peppers and steamed carrot slices. Kumpir, too, is found in shops and food stalls throughout the city, but the best place to try it is along the waterfront of Ortaköy neighborhood in Beşiktaş, where Kumpir Sokaği (Baked Potato Street) was named for good reason. Although the culinary elites of Istanbul disdain kumpir, the crowds of loyal customers it draws means it is well on its way into the city’s polyglot pantheon of street food classics. Even after sampling a couple of dozen dishes each day, we concluded that there was still much work to be done. Even in a few weeks it would be impossible to sample more than a fraction of the food offered on the streets of Istanbul. There are dozens, if not hundreds, of other delicacies to tempt the passerby. Things like salepi dondurma, a chewy, elastic ice cream similar to gelato made from powdered orchid tubers; or nohut dürümü, a spicy pide wrap from the southeast of Turkey filled with garbanzo beans, onions, peppers and lemon juice; or içli köfte, the golden, deep-fried, torpedo-shaped bulgur wheat shells filled with onions, ground meat, parsley and secret spices. And künefe. How can I leave out künefe? The sweet, buttery dessert of wiry threads of kadayıf or shredded phyllo dough sandwiching a molten layer of salt-free hatay cheese all drenched in a syrup of honey and sugar, served piping hot and topped with kaymak, the thick cream-top skimmed from the surface of yogurt, it is finished with a flourish of ground green pistachios. Clearly, it is time to return to Istanbul to continue the search for these and other streetside wonders. Random House author and photojournalist Eric Hansen is a frequent contributor to AramcoWorld. He lives in California’s Central Valley.